Not a self-portrait. See end of post for all image credits. I listen to a lot of podcasts, and The Infinite Monkey Cage is one of my favorites. Driving to and from work is a little less unbearable when your show is on. On behalf of everyone who’s alive today because your blend of science and humor prevented me from dozing off and crashing into them: thank you. No monkeys were harmed in the making of this picture. I was, however, disappointed by your response to ongoing criticism that your program’s title promotes inhumane monkey husbandry practices. Your assertion that an infinite monkey cage would be “roomy” is misleading at best. An infinite cage might be roomy, or it might not. 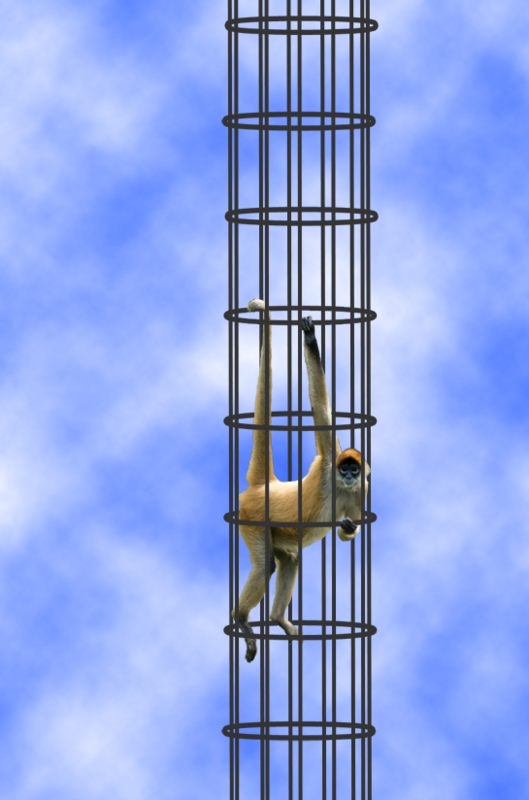 An infinitely tall cylindrical cage would feel pretty cramped if it were only as wide as the monkey inside it. The monkey’s movements would be limited to climbing and spinning. While monkeys are avid climbers, I believe most would find such an environment claustrophobic. Never underestimate the importance of the cage-height-to-monkey-height ratio. You might think that an infinitely long, infinitely wide cage would have to be better. It wouldn’t. It all depends on the cage-height-to-monkey-height ratio. A nine-inch-long Geoffroy’s tamarin, for example, wouldn’t be happy in an 8.75” high cage. He’d have more freedom to travel, but he’d be forced to maintain an unnaturally stooped posture, leading inevitably to back, neck, and/or hip pain. A veterinarian wouldn’t be able to squeeze into the cage to treat him; your only recourse would be to toss in some ibuprofen-laced bananas and hope for the best. The prognosis would be bleak: monkeys almost never comply with this treatment plan, because ibuprofen-laced bananas taste terrible. Solitary simian seems so sad. 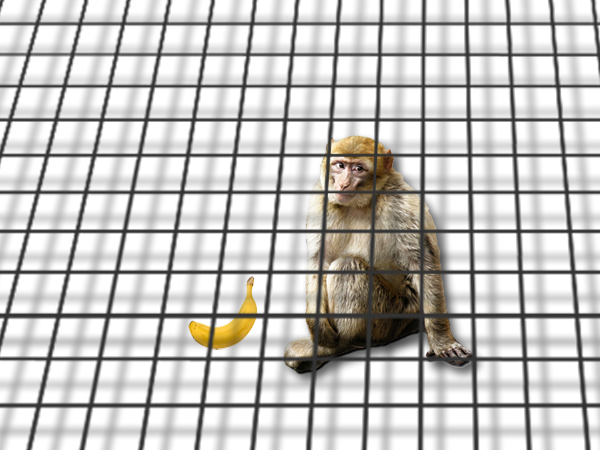 A cage that extends infinitely far in all three dimensions would be roomy – but a solitary monkey in such a cage would be lonely. Monkeys are social animals and can’t handle that kind of isolation, even if you give them iPads and show them how to use Facebook. 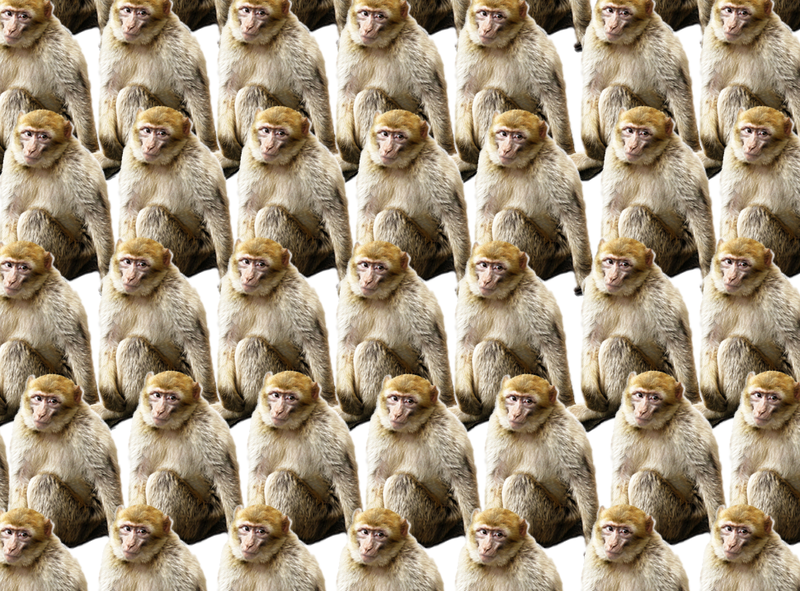 The obvious solution would be to add an infinite number of monkeys for company, but you’d need to get the density right. If each monkey were a thousand miles from its nearest neighbor, you’d wind up with a desolate cage populated by infinitely many melancholy monkeys. On the other hand, if they were packed in too tightly, the monkeys would begin to get on each other’s nerves. They’d gossip and call each other names, and soon you’d have an all-out infinite monkey brawl on your hands. Massed monkeys: mob mentality, madness, maybe mayhem. Maybe you should start with a finite number of monkeys. That’s all you’d be able to afford anyway, after blowing your budget on cage construction and amenities like gravity, air, and monkey food. If you put a bunch of monkeys in a cage that extends infinitely in all dimensions, then in theory they’d be able to spread out to a comfortable density. But be careful – monkeys can travel only so fast, so if you put too many monkeys too close together, the ones in the center will die of old age before they ever get to experience roominess. I don’t mean to lecture you. I’m just concerned that some of your more impressionable listeners might take your remarks at face value and wind up constructing poorly-designed, inhumane monkey cages. Perhaps you should consider changing the name of your show to something more socially responsible, like The Sustainable Monkey Habitat. 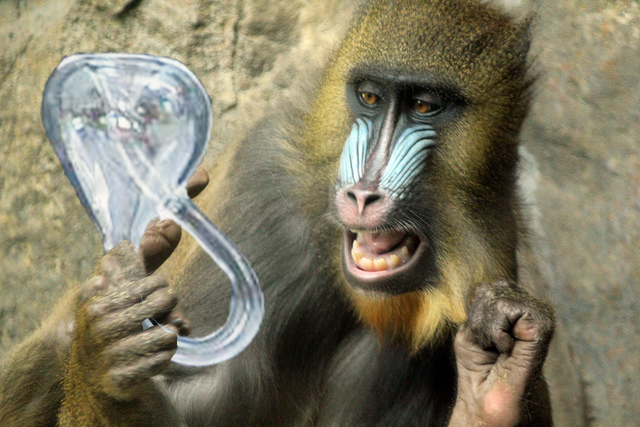 Image credits: Typing monkey from WikiMedia; spider monkey from Tancread’s flickr stream; sideways-looking monkey from epSos.de’s flickr stream; banana from Wikipedia; delighted mandrill from Chris Arneil’s flickr stream; Klein bottle from Acme Klein Bottle. Update: A finite number of monkeys respond to this letter in the last few minutes of the July 2 episode (“Does Size Matter?“). The only way an infinite monkey cage would work is if you put hats and costumes on all the monkeys. Then it’s just funny. Do you think we could teach the monkeys to make their own? I’m not sure I can afford infinitely many hats. We are all in this cage already. Does it seem crowded in here to you? And if you start with finite monkeys, you’ll end up with infinite monkeys soon enough. It only seems that way if you have to clean up after them. Great post. Monkeys shouldn’t ever live in cages. They deserve to live in their natural habitat. Zoos work very hard to enrich the environment of their monkey inhabitants! I thought Robin and Brian were the monkeys. I think Shakespeare said it best: all the world’s a cage, and all the men and women merely monkeys. What if “infinite” were actually modifying “monkey,” instead of “cage”? 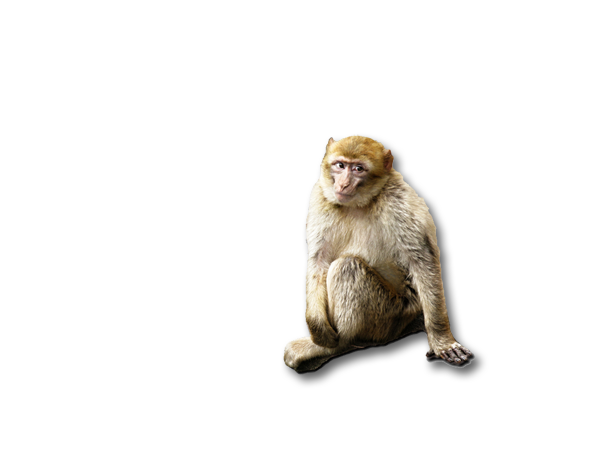 In this case the monkey would be infinite, but the cage’s size is undefined. This really highlights the importance of well-placed hyphens. A couple people actually brought this up on twitter, including one person who theorized that we’re all inside an infinite monkey inside an infinite cage. But maybe all those interpretations are wrong. Maybe there’s no hyphen at all. If we’re inside a monkey, then maybe the monkey is our cage. A monkey/cage. Thank you for saving me the trouble of pasting that into Google Translate. Thanks Laura! Loved the post, and I can’t wait to add this show to my podcast lineup. Do you listen to Radio Lab? Also, I just got my first smart phone. I still feel like a monkey, but one with a higher phone bill. RadioLab is definitely one of my favorites, along with This American Life, The Moth, StoryCollider, Planet Money, Wait Wait Don’t Tell Me, and Science Friday. I also listen to some other ones that are either slightly less favorite or that I’ve just started listening to and haven’t quite decided how much I like them. Now I’m starting to regret not ending the post with a request for podcast recommendations. Monkey density. That’s what I like about you, Laura. You tackle the issues that need to be addressed. Great research here. I’ve always felt that the secret to comedy is rigorous fact-checking. I love that! It’s much more whimsical than my picture. It kind of reminds me of Hitchhiker’s Guide to the Galaxy, although I don’t really know why.